Better late than never I suppose as T-Mobile finally drops official word via their social media channels that the G-Slate arrives Wednesday April 20th. Where have we heard that before? 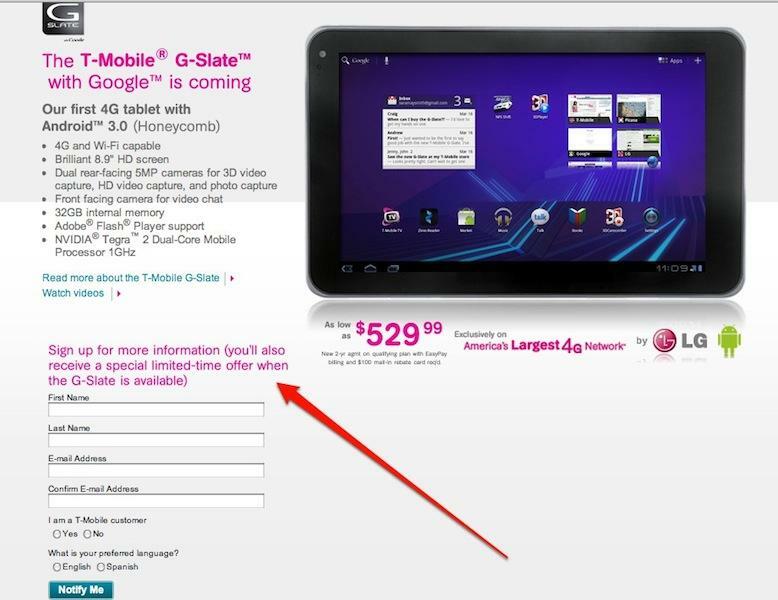 What’s more is T-Mobile is reminding those who sign up on the G-Slate information page that a special “discount code” will be emailed to you if you sign up prior to April 20th. That makes today your last chance so get cracking! Find the sign up link below! So, what’s the “special” discount? Basically the launch price is gonna be $629, unless you signed up and they send you a $100 MAIL IN rebate for a grand total of $529 whenever you get your rebate check in. Personally, Im a bit miffed at that. Well that’s the deal whether you signed up on that site or not. does anyone know what the “special deal” will be. I will wait for an email, but plan on buying tomorrow. Haven’t received anything yet, as of 9am April 20th. Hmm, if I signed up previously would the discount still be emailed to me? I don’t see why it wouldn’t be. I know they’ve had that little offer on the email sign up list for a while now. They aren’t the only ones who did that though. The galaxy tab is the same way. What’s a widow zoom? I’m still married so I have no clue, please enlighten me. I think it’s got somethin to do with when your best friend starts dating your wife after you die. You already get a $100 mail-in-rebate. Its required and it says it in the small print on their website. Thats what brings the the price to $529.00. So what the discount code will be, guess we’ll find out tomorrow. I really wanted this device but $529.00, call me cheap but thats why to much. Thats 2 car payments. Im thinking of just picking up the nook color. No contracts, no obligations and the potential to put honeycomb on it some point in time. Also in order to get this device you need to sign up for 2yrs and the easy pay plan( automatic deductions). Screw that ill pay my bill on my own. other than that i still love T-mobile. The only requirement is a credit check and two year contract. You do not need to set up easy pay. If they tell you that the sales rep is lying. I rarely but people on easy pay. To qualify for the mail in rebate you do. BTW I’m a tmo employee. So if it’s a two year contract , that will take you into the AT&T take-over time frame. Does this unit have the AT&T 3G radio in it ? AT&T has PUBLICLY ANNOUNCED they plan to shut down T-Mobile’s 3G/4G network within a year or two of taking over. They’ve been quite open about it, and the fact they’re buying T-Mobile for the spectrum (TMo has AWS across the entire country), not for any other reason. If AT&T just wanted to improve its network quality, it would be infinitely cheaper to just do it, rather than buy a second network. AT&T isn’t shutting down AWS HSPA + anytime soon even if the merger was approved tomorrow. They are simply going to refarm a portion of it to help support their LTE buildouts in specific markets that need addtional capacity that the 700 MHz network can’t offer. They are NOT simply shutting the HSPA + network off leaving customers without any usable service. That idea was pulled out of some paranoid kid’s @ss and keeps spreading around the internet like a virus. You seriously think AT&T wants to create massive churn allowing millions of users to just walk away? AT&T has also stated they will offer any customers affected by future (read future again and again) incentives to use a comparably priced replacement device. If they make your Tablet unusable they’ll have to replace it with something similar or face a huge PR nightmare. Stop spreading FUD. You guys act like a bunch of worried old ladies. Get this Tablet if you want it now. Nobody on sites like this actually keep their devices that long anyways. The buyout isn’t even approved and probably won’t be for another year if at all. Well Moron , they will convert those towers to what ever they like to fit AT&T’s needs not to leftover T-Mobile customers needs. They are going LTE just like Verizon and they could care of less what T-Mobile customers want after they take over. More likely they will use those towers for their frequencies not T-Mobile’s, that way all T-Mobile customers now on AT&T service will have to buy a new phone. So who would buy a new unit that’s not compatable to AT&T’s 3GG service ? It will be a nice paper weight for the future unless you use it on WIFI only. Actually for this rebate you have to. It even says it in the fine print on the g-slate site. But once you get the rebate you can take yourself off easy pay. You would be on it for one, MAYBE two bills. Maybe you should get a new car first. For the price, I think I’ll wait for the Asus Eee Pad Transformer. Then I’ll just use my phone’s wifi hotspot to connect when I’m out and about. Even with the keyboard, it’s still a solid option for the price. i actually picked up the blackberry playbook, and it is nice. tmobile messed us over on this one, and lost out on my purchase. Sorry too expensive. Bring on the HTC Flyer. yeah right. it wont work in a year. cept on wifi. This is whack. Wiggity whack. The XOOM will be LTE soon. why not let it rock my world. Or, wait on the flyer better yet the second one with a larger screen. By then the market will have crashed and they will be giving this away. With inflation going thru the roof, if it aint food its going down. wow gold just hit 1500. You better save your pennies. This thing is just too expensive now that we know Asus, Acer and Samsung will have cheaper tabs. 479 ( assuming $50 special code…) is a pretty good price for the best android table on the market TODAY…. What makes this better than any other tablet out there or coming out within the next 30 days? 3D is not a feature most people are looking for. If people don’t care about 50 inch 1080p TV’s then I don’t see them rushing to get a 9 inch tablet that requires 3d glasses. $480 wifi only will be a good deal, $480 on a two year contract is not a good deal. so you want this thing that obliterates the ipad to be cheaper than the ipad? really. well then next time you come across a ferrari thats cheaper than a toyota you let me know. It does what to the Ipad? Let’s not get ahead of ourselves now. Anyone who knows me will tell you that I don’t like apple products for one or two reasons but I’m not a blind Android fanboy either. The Ipad2 might not have 3D but it’s a really nice device and in this context, it’s actually the Ferrari. It might not have customization and what not but they’ve done a lot of things right and will keep on selling millions. Secondly, apple has the customer base that will buy an ipad if they sold it $200 more than it’s current price. What the Android OEM’s are forgetting is that they are not apple and need to undercut apple, not match them dollar for dollar with their first gen devices. We all know how well that worked for the Xoom. Acer, Samsung, Asus, and Toshiba seems to be on the right track to compete this summer and I’m looking forward to picking up my first tablet from one of them. Unless Google releases a Nexus tablet next month of course. I just got an email from t-mobile reminding me about the special offer & how i’ll get a promo code within 48hrs. If the code isn’t available by early tomorrow morning, I’m just going to buy it at the regular price. I don’t want to risk this thing selling out. I’ve been waiting waaaaaaay too long for this. I dont think this will sell out though..Not many people realize the value. i’m more concerned about limited availability. Who sends out a mass email saying, ‘Please don’t buy our product.’? Does anyone know when the code will come out or how much it will be? email the friggin code already!